beds and cabinets. About six months ago, Efi Frida (39) and her husband Eli (41), from Mizpe Avtalyon in the Galilee, purchased a Roomba to assist them in the household cleaning. The Fridas have two children, Jonathan (7) and Yael (4), in addition to two cats and two dogs. One evening last week, Efi turned on the robot and left the house. When she returned home she noticed that it had stopped and was beeping. She tried to turn it back on but it would not restart. 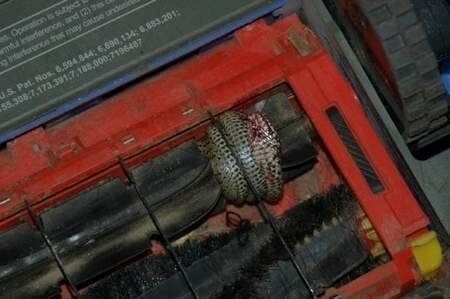 Efi opened the machine and, to her horror, discovered a Vipera Palaestinae, a venomous snake that had been sucked up by the machine. The snake was wound thoroughly around the cleaning wheel and had received injuries to its head. By the time Eli came home the viper died of its wounds. The family of Yaakov Avinu grew rapidly. The Egyptians hastily mobilized to impose a Final Solution to solve the (trumped up) problems caused by the burgeoning nation. They enslaved the Jews mercilessly, subjecting them to a horrific and inhumane workload. Years went by, then decades, and centuries. The Jews had become an enslaved people, the bane of Egyptian society. But they had scant memories of a glorious past, and nebulous promises of a prominent future. Finally, G-d hearkened to His People’s myriad plaintiff cries and began to pave the way towards their redemption. G-d appeared to Moshe ben Amram and instructed him to set the trajectory in motion by standing before Pharaoh and demanding that he release his Jewish slaves. Moshe desperately tried to shun the awesome responsibility, reasoning that he was inadequate and incapable. But G-d was adamant that he was the right person for the job and Moshe finally agreed to embrace his mission. Moshe returned to his father-in-law Yisro in Midyan and bade him farewell as he prepared to embark upon his fateful return to Egypt. This entire event seems difficult to understand. The fact that Moshe was ‘derelict’ in circumcising his son was only because he was engaged in the most sublime responsibility that he had just been compelled to accept. Moreover, one who is engaged in performing one mitzvah is exempt from performing any other mitzvah that may interfere with his performance of the first mitzvah. So why was Moshe at all liable for not circumcising his son? Also, why is there no open space in the Torah between G-d’s message to Moshe and this event? It seems that the Torah wishes to emphasize that the two are connected. I once heard the following explanation: The Torah here is stressing that NO ONE is above the law. Even the great Moshe - who was en route to become the emissary of G-d in redeemig His people, the future transmitter of the Torah at Sinai, the only mortal who would ever speak to G-d ‘face to face’ in normal conversation as it were, and the consummate leader - was subject to the laws and mitzvos like any other Jew. The Shulchan Aruch was written, and is binding, from the simplest Jew to the most erudite scholar. Rabbi Lazer Shach zt’l explained that perhaps Moshe was indeed exempt from circumcising his son, according to the letter of the law. However, because Moshe was now setting out to fulfill such an integral mission he should have realized that he needed every possible merit that he could accrue. The mitzvah of circumcision is an incredible merit for all those involved, and Moshe should have taken that into account. He may have been exempt, but for the mission he was involved in the merit of that mitzvah was indispensable. The great Moshe was taken to task for failing to realize that point. Truthfully there is a deeper idea contained in this event, which serves as an invaluable lesson for those involved in communal affairs: A leader or community activist must always remember that although he is involved in holy work, he is never excused from his primary duties – caring for his own family. There was no greater activist on behalf of his people than Moshe Rabbeinu. Yet he was held accountable for somewhat neglecting his responsibility toward his own son. There is no separation between G-d’s message to Moshe regarding saving the nation and the incident with the snake. It demonstrated that just as saving the nation was a binding divine obligation so was Moshe’s responsibility to perform his son’s circumcision. All of one’s responsibilities notwithstanding, one can never forget that his priority is his own family. This idea does not only apply to the education of one’s children, but in marriage too. Rabbi Chaim Freidlander zt’l explains why marriage is such a necessity for one’s personal growth. It is a wonderful mitzvah to be involved in acts of chesed (kindness) for others. It demonstrates a level of altruism and selflessness, and shows that the doer lives for others, not just for himself. However, if one chooses not to involve himself in any particular chesed for whatever reason, although he forfeits that opportunity, it is not necessarily a detriment to the recipient. Someone else can step in and do what is necessary. However, in regards to emotional, psychological, and physical support of a spouse, only the other spouse has the ability to fulfill those needs. That is chesed that is specifically incumbent upon the spouse, and no one can adequately substitute for a spouse. We lead very busy lives and we have many responsibilities that need to be taken care of within limited amounts of time. Still-in-all, we must realize that our primary responsibility is to our families. There are many responsibilities that others can help us with, but no one can be the parent of our children or a support mate for our spouse, aside from us. It can be added that, at times, life definitely seems to spin like a vacuum cleaner. But no one knows and understands how to help us ‘pluck out the venom’ from our lives like a parent or a spouse.